Most of us are pretty familiar with responsive Web design by now. Basically, it uses a combination of a fluid layout and media queries to alter the design and layout of a website to fit different screen sizes. There are other considerations, too. For example, a lot of work has been done on responsive images, ensuring not only that images fit in a small-screen layout, but that the files downloaded to mobile devices are smaller, too. But mobile design isn’t just about layout and speed: it’s also about user experience. In this article, we’ll focus on one aspect of the user experience — navigation menus — and detail a few approaches to making them work better on mobile devices. By responsive menus, we mean quite simply navigation menus whose presentation or behavior is altered on different devices and screen widths.There are various approaches to achieving this, whether by using CSS or other languages such as PHP. In this article, we’ll look at what can be done with CSS media queries. It could have different styling, fitting differently in the browser window, or possibly looking like a menu from an app. It could have different content, with the links adapting to the device they’re being viewed on. They could appear in a different location on the page or screen. For visitors using a small screen, the user experience requirements for navigation will be different. The first and most obvious reason for this is the size of the screen itself; the navigation will need to fit in that space without dominating the page (unless you want it to). Another factor is that navigation on most mobile devices has to be tapped on. The thumb is larger and less precise than a computer mouse, so your navigation links might need to be larger. This holds true even on large tablets such as the iPad, whose screen size is comparable to that of a desktop monitor but is still being tapped with a finger rather than clicked with a mouse. 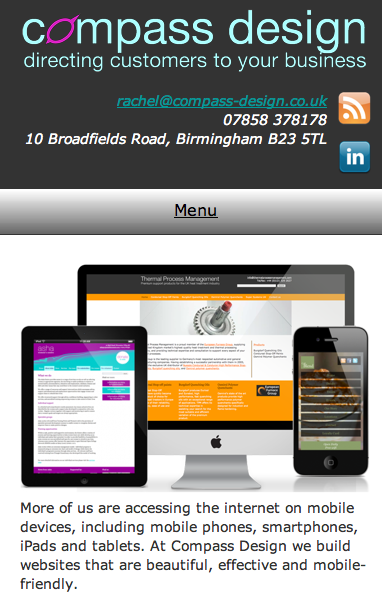 DesignThe navigation is integral to the design, so it might not look right with a different layout. 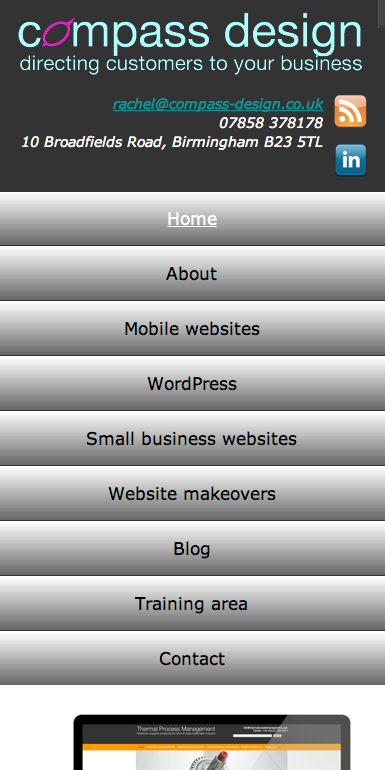 The simplest adjustment to a responsive menu would be just to enhance its appearance. ErgonomicsNavigation links on a mobile website need to be large and clear enough to be able to be used with “one thumb and one eye,” as Luke Wroblewski asserts in his book Mobile First. In its “User Experience Guidelines,” Apple advises making anything tappable the size of a fingertip, which it defines as 44 points square, or approximately 57 pixels square. This is a lot bigger than a link in a text-based menu, which might be only 14 pixels high. Thus, the clickable area of a link on a mobile website should encompass not only the text but the area around the text, and ideally this would be apparent to the user. User experienceUsers might interact with your menu differently on a mobile device. In addition to the content of the menu and the size of the links, consider how the position of the menu will affect user experience. For example, a user who has scrolled to the end of a long blog post will not be inclined to scroll all the way back up to interact with the menu. Some designers fix the menu at the top or bottom of the screen to get around this, or they move the navigation to the bottom of the page and add a “Menu” link to the top. Some designers partially hide the menu until the user taps on it, to reduce the amount of screen space that it takes up — particularly important with fixed-position menus, which will hide all of the content if you’re not careful! So, those were some of the benefits of responsive menus. Obviously, they will vary according to the website’s content, layout and functionality. Your approach will also depend on the time and budget available; some of these approaches aren’t a quick fix and could take some time to get right. Let’s look at some approaches that can make navigation work better on small screens, working our way from the quickest and simplest up to the most complex. We could first do simple design tweaks to make the menu look better on narrower screens, focusing on landscape and portrait modes (i.e. screens narrower than 480 pixels). 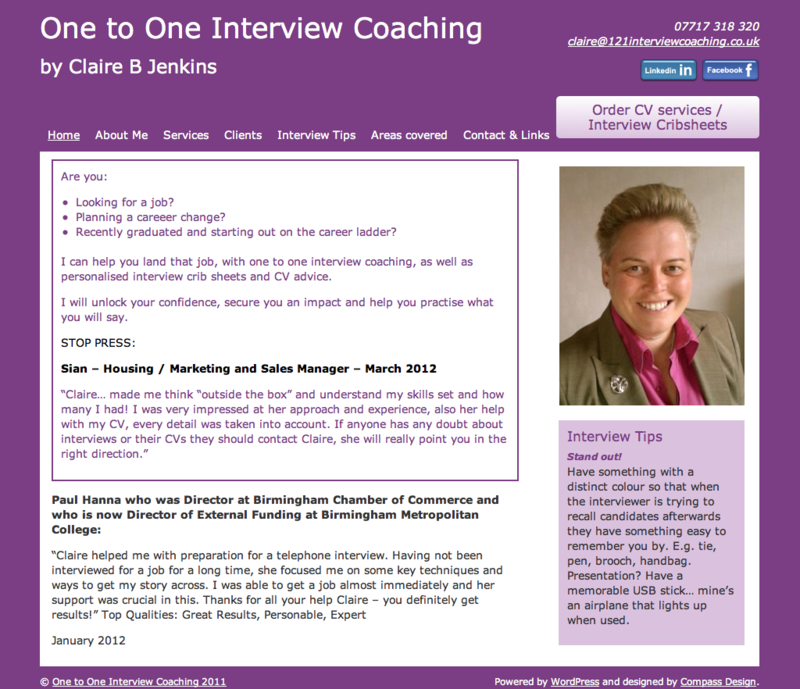 The screenshot below is of the desktop design for One to One Interview Coaching, which has fairly simple one-level navigation. The most important tappable area on this website is the button above the menu, which has been resized to make it easier to tap on small screens. But the left-aligned menu below looks a bit scruffy and would look better centered. This code centers the text of the menu as a whole; removes the floats from the list items and links; and displays the list items inline rather than as blocks. If all we did was center the text, then each link would appear as a centered list one above the other. The links are now nicely centered. We just had to slightly edit the menu text, shortening “Areas covered” to “Areas” to make that link span one line instead of two. Obviously, this hasn’t improved the ergonomics or functionality of the menu much, but it has improved the design, and it took just moments. Making the links larger would be another usability improvement here. 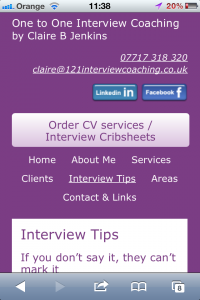 But instead let’s look at the size of navigation links on a website that needs more radical changes. Accurately tapping the links in the average navigation bar is not as easy as it should be on a small touchscreen device. We can help this both by making the tappable areas larger and by making the links look more like buttons, which sends a very clear signal to users of where to tap. Tappability is an issue not only for phones, but for larger touch devices, such as tablets. My own website, Compass Design, is responsive but not yet optimized for touch interfaces. Its layout on the iPad and other large tablets is similar to its layout on desktops, which might look fine, but the navigation links are too small for the user to tap comfortably. On narrower screens (such as when in portrait mode), the navigation drops to a second line, which looks messy. We can fix these issues by making each link the same width, with text spanning two (or more) lines if need be. This would make each link larger without adding to the overall screen space taken up by the menu. The only downside is that this approach only works if you know how many links are in the menu — if you add more, then the CSS will need to be tweaked. Sets a manual height for each link, and centers the text. This makes the link in each menu item behave like a table cell, and it enables us to center the text vertically, a technique documented on CSS-Tricks. The navigation links are now large enough to tap with a thumb; they look more like buttons; and the layout is much neater. This is a good solution for when the horizontal navigation is too wide to fit on the screen without the text wrapping. We’ve achieved some improvements in both design and UX, with just a few lines of CSS. As you can imagine, this layout would look terrible and be nigh-on impossible to use on very narrow screens, such as phones. To fix this, we’ll make each navigation link stretch the full width of the screen and make it large enough to tap. Alters the height of each link and the text size, which makes the link button-like, with text that almost fills it and that is clearly legible on a small screen. The tappability has improved, but the menu now dominates the screen and pushes the content below the fold. This needs to be fixed. Which brings us to the next aspect of responsive menus: their position. On tablets and desktops, keeping the menu at or near the top of the screen makes sense, because this is where users would expect to find it, and it doesn’t take up too much of the screen there. But what about small screens such as phones? In his book Mobile First, Luke Wroblewski advocates for moving navigation to the bottom of the page on smartphones. This way, when the user has scrolled to the bottom of a page and has finished reading the content, they have somewhere to go. Let’s try that for this menu. I haven’t worried about calculating the height of each link. I’ve just set it to the recommended 57 pixels, which is close to what its height was in ems. This moves the navigation to the bottom of the page, between the main content and the footer. I must own up that I did make one change to the markup — I needed a containing element for the menu, which ends before the footer, so I added an empty div with a container class. The div opens at the very top of the body element and closes just before the footer. Without that container, the menu would have moved below the footer to the very bottom of the page. The menu is now less obtrusive when the users first arrives on the website, but it still takes up a lot of room. A possible solution would be to convert it into a select menu, using the Responsive Select Menu plugin. This would probably be the best approach for very long menus, multi-level menus and menus that are likely to have links added or taken away. 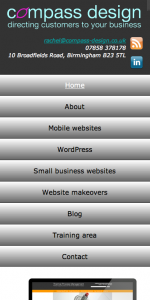 For this website, however, I’ll stick with the CSS styled menu. But there is still one problem. A new visitor who lands on the website’s home page on a phone and wants to navigate around will be presented with content and no menu, unless they think to scroll down — and we certainly couldn’t expect users to know that they need to do that. This is a broader issue, and it also relates to where to deliver the menu on different devices. Let’s deal with that next. There are a number of methods for delivering a different menu to each kind of device. 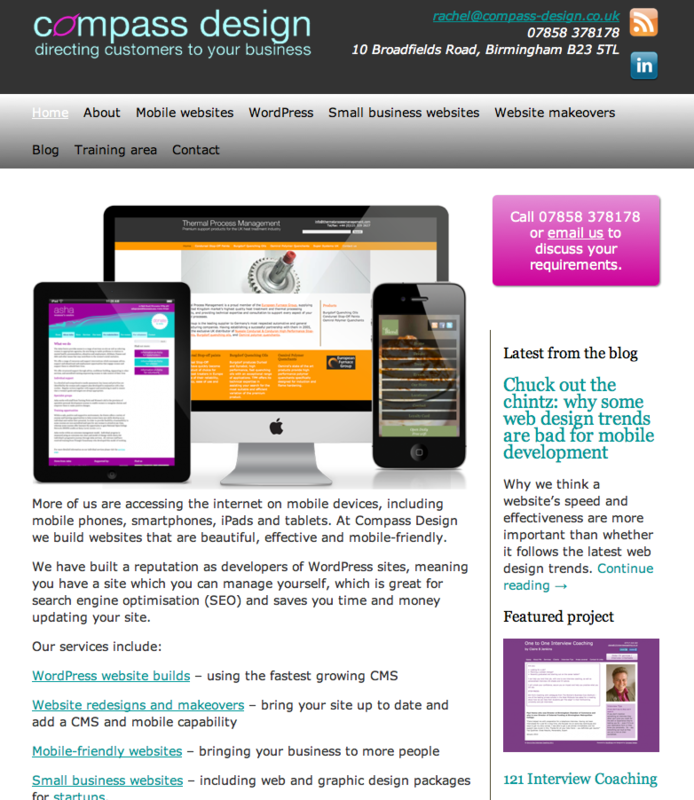 If your website uses a CMS, then plugins or conditional code would likely achieve this. Here we’ll look at a way to achieve this purely with CSS. The downside to this method is that it’s based on screen size, not on device, so it assumes that a visitor on a small screen would need a different menu (or at least would benefit from one). It also includes two blocks of markup for two menus, which are delivered to all devices but one of which is hidden using CSS. 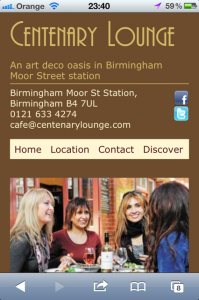 However, if your menus are just text, they shouldn’t put too much of a strain on the website’s loading times. While I’m not an advocate of hiding content from mobile visitors, and I get really frustrated by websites that do, I do think that restructuring the navigation for mobile devices is sometimes helpful. For example, customers who are checking a business’ bookings, times and locations on their phone need to be able to get at this information quickly and easily via the navigation. For some websites, this would necessitate radical alterations to the navigation on small screens, creating a more app-like menu, while — importantly — including access to the other areas of the website elsewhere on every page. For other websites this would simply require a menu with a different structure, or possibly one with fewer top-level links that fits better on a small screen. In this case, we just need to add a single link that appears on mobile devices only. What we want to do is create a link to the navigation menu near the top of the page that redirects visitors to the menu. The styles for the .menu-link element are the same as for the navigation links, which we styled earlier. 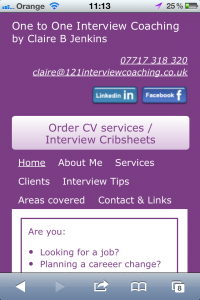 We know how to hide links on large screens using CSS, but what about hiding an entire navigation menu? To do this, we use the exact same technique. I developed a website for Centenary Lounge, a coffee shop in Birmingham’s Moor Street station, and the client wanted not only a responsive website but an optimized menu for mobile devices. 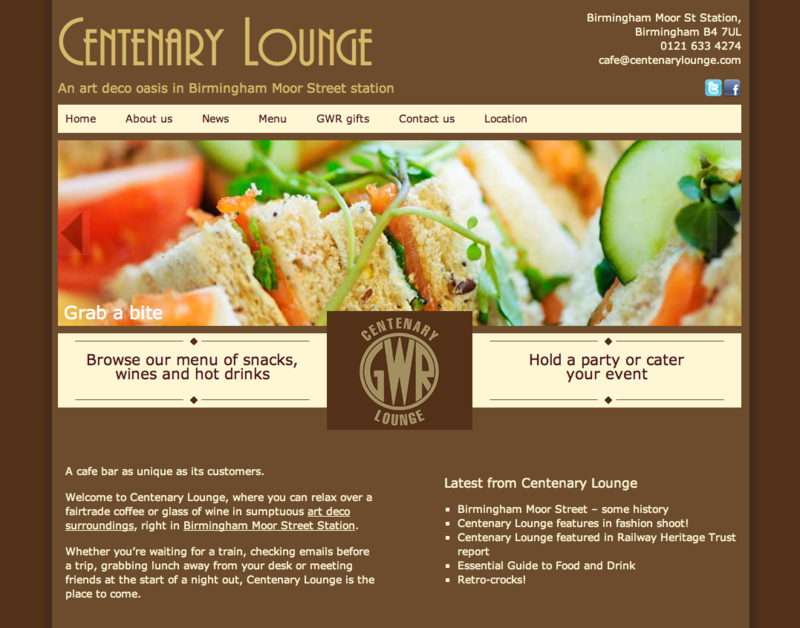 The desktop navigation was large, with links to a lot of historical information on the coffee shop and its history, however, mobile users needed to be able to find out where Centenary Lounge was and when it would be open. This hides the menu and removes it from the flow of the page. This reverses the earlier code for the mobile menu, making it visible, and hides the desktop menu. It doesn’t specify that the desktop menu needs to be displayed for desktops because that is the default anyway. Access to the full content of the website is still there via the “Discover” link, but reducing the number of top-level links has made better use of the space and made the most commonly used links more prominent. As with all mobile design projects, the question begs to be asked whether a similar change would benefit the UX on the desktop! Make quick tweaks to the visual design of the menu to make it better fit a mobile layout. Enhance the tappability of navigation links by ensuring they are at least 44 pixels square and that they look like obvious links in a mobile context (mobile users might be more used to tapping on buttons than text). Consider the best location for navigation, and move the menu to the bottom of the page, using only CSS. Use CSS to display a different menu depending on the device being used. The solutions you adopt will depend on a number of factors, including the needs of the website, the nature of the menus and the expectations of users. Not to mention, for websites using a CMS, delivering different content to different devices without CSS and without sending unnecessary markup to each device is often possible. However, for text-based menus, using CSS to reposition, hide and restyle mobile navigation is a fairly straightforward and flexible approach that is definitely worth considering.